Anyone sick of the mosquitos yet? We are a sports family and have been going to football camp 4 nights a week for 3 weeks now and the mosquitos and gnats have been horrendous. Also, it doesn't help that we recently had major rain and flooding. We've tried multiple skin soft insect repellents and clip ons and nothing had been working that well. Actually, the Off Clip Ons were useless, we watched mosquitos fly right up to the clip on and sit on it. Consumer Reports has come out with their list of top tested insect repellents and here are their top 4 and where you can find them. The top repellents had about 6 and a half hours of protection. The lower rated sprays only lasted about 2 hours. 1. 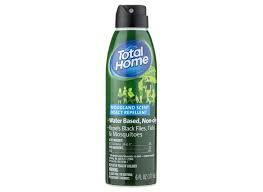 CVS Total Home Woodland Scent Insect Repellent with 30% deet Currently on Sale!! 2. OFF Deep Woods Insect Repellent Dry with 25% deet 6 Pack Deal!! 3. Repel Oil of Lemon Eucalyptus with 30% oil of lemon. 4. Sawyer Premium Insect Repellent with 20% Picaridin.